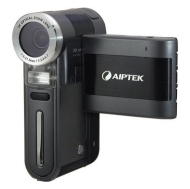 alaTest has collected and analyzed 28 reviews of Aiptek GO-HD High Definition 720p Camcorder. The average rating for this product is 4.0/5, compared to an average rating of 4.0/5 for other Camcorders for all reviews. People are impressed by the viewfinder and usability. The image quality and price also get good views. There are some negative opinions about the reliability and durability. We analyzed user and expert ratings, product age and more factors. Compared to other Camcorders the Aiptek GO-HD High Definition 720p Camcorder is awarded an overall alaScore™ of 76/100 = Good quality. Great Video, but now what? It is rated for a 32MB SD Card. I bought an 8MB SD-HC card and the capacity is 8hrs 55mins(!!!) for normal 480 video and 4 hrs 25mins for HD 720 video. I think a tripod for stability since it is so light is real requirement - I did get one. Inexpensive! And quite compact. I bought it to make video for YouTube (how-to's), take videos of my little girl, and help me review my figure skating. Compact, performs everything I need it for. Camera takes pictures at up to 8 megapixels. Video is amazing from this camera. The camera side of this is a little iffy. If you have shaky hands (like myself) it's hard to get a good picture but when you do, it's REALLY good. The zoom is a bit slower than most cameras that I'm used to. It's okay, maybe good compared to others. I don't really recommend it because I have found much better products, but you can choose for yourself if it suits your style or not. Good price though. I've had the Aiptek GO-HD for over a year now and still awe in it's features, even though I bought it for $250 when it came out. Aiptek has pushed the envelope yet again, bringing a true HD 720P camcorder into the spotlight with the GO-HD! This marks another major milestone for Aiptek and provides another exciting, groundbreaking value to the market. GO-HD captures true-to-life, vibrant colors and astonishing High Definition images like you've never seen, right in the palm of your hand. The GO-HD comprises 720P (1280x720 resolution / 16:9 aspect ratio) at 30 frames per second using advanced H.264 technology. And with a 3x Optical Zoom with Auto-Focus you're sure to capture the finest quality and detail in every moment. The GO-HD also functions as a 5 Mega Pixel digital camera with a CMOS sensor and Auto-Focus, giving you even more quality choices on how you want to capture the moment. Replaying your images is a snap as the GO-HD offers virtually unlimited choices and compatibility. You can choose to view your HD images instantly by playing them back on the GO-HD's 270-degree swivel-reversible 2.4" TFT color LCD display or connect the GO-HD directly to your HDTV, HD Monitor, Standard TV or PC. Once in a lifetime moments, family events, outings, or just goofing around can now be captured, replayed and relived in a whole new way. AIPTEK's GO-HD is High Definition at an affordable price. And now Aiptek makes your life in HD possible.